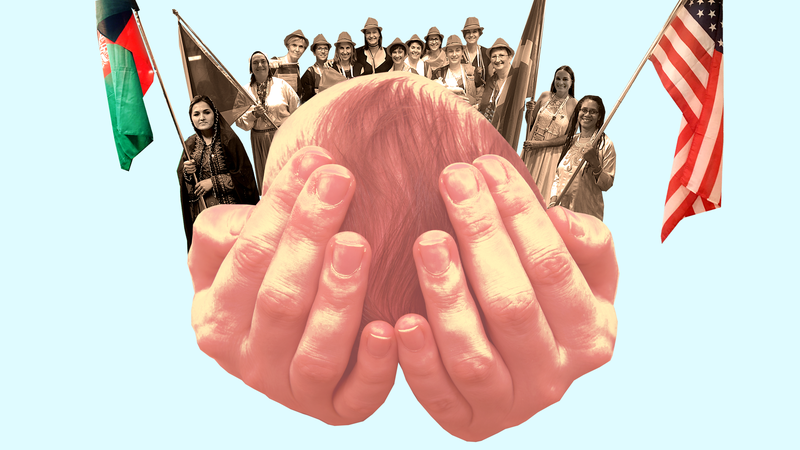 Among North America’s coastal elites, midwifery has become associated with finicky preferences, rigid orthodoxy, and a commitment to doing things right. Regular folks have hospital births. Folks who want to “win” at childbirth by forgoing the epidural, or who turn up their noses at chemicals that course through one’s body during induction—they see midwives. Midwives themselves are often associated with a philosophical rejection of medical intervention in childbirth. Many North American women feel that midwifery subjects their choices to unwavering scrutiny—you must breastfeed until your baby is a year old, you must wear your baby. But these notions are painfully ironic because outside of the contemporary Western context, midwifery isn’t and never was for elites. It’s the actual oldest profession. A group of Welsh midwives wear bonnets in the shape of Wales’s national flower, the daffodil, at the congress’s opening ceremony. Photo by Kathryn Jezer-Morton. On June 18, I was in Toronto for the triennial congress of the International Confederation of Midwives, a non-governmental organization that represents approximately 300,000 midwives across 114 countries. On my way there, I had made a little joke to myself—that I was heading to a gathering of friendly women in sensible shoes. In retrospect this fleeting thought embarrasses me. In many parts of the world, a midwife is the only health care provider that a woman will ever encounter. Personal style does not enter into the equation. Associating midwives—even North American midwives—with a certain aesthetic or ideology is unimaginative and, more to the point, it’s a dismissive hand in the face of the urgent and often overlooked work of providing compassionate maternal care. The congress’s opening ceremony felt like some kind of Women’s Health Olympics; a procession of midwives wearing outfits that represent their home countries carry their national flags into a huge hall to resounding cheers. As they walked in, the countries where midwives work under the most difficult conditions, like Somalia and Afghanistan, received extra applause. Many midwives in attendance repped their country’s cohort of with pride. The 400-odd Australians in attendance wore bright red cowboy hats. A group from Japan wore traditional kimonos. The midwives from Indonesia wore hijabs of a particular textile that designates their professional affiliation. Midwives from Mali, Cote d’Ivoire, Zimbabwe and Ghana all wore dresses made of material printed with their midwifery associations’ name and logo. A supremely endearing group of Welsh midwives wore giant bonnets shaped like daffodils—“Wales’s national flower!” they informed me. A group of Indonesian midwives at the conference, all but one of whom are wearing custom uniforms with a textile that designates their professional affiliation. Photo by Kathryn Jezer-Morton. Midwives from the Ivory Coast at the opening ceremony, both wearing dresses made with custom textiles bearing their midwife association’s name. Photo by Kathryn Jezer-Morton. Saraki told me that Nigerian hospitals require that women arrive to give birth with their own medical supplies. “You can imagine, in areas where we have grinding poverty, women can’t afford these materials, so they don’t seek medical care.” For many years, the Wellbeing Foundation Africa distributed “Mama kits” to expectant mothers, equipped with all the required items. Recently, Mama Kits have proven essential in camps for internally displaced people in Nigeria. A cohort of German midwives prepares for the congress’s opening ceremony. Photo by Kathryn Jezer-Morton. I had come to Toronto fresh from having been reminded by several friends about the ways that midwifery had let them down. One friend had been handled hastily and without adequate communication in the wake of an unexpected complication in her son’s birth. Another felt that her midwife had not presented formula feeding as a viable choice, which led her to go through a hellacious three months of anxiety while trying unsuccessfully to increase her milk supply. Once I’d set aside the assumptions of my East Coast milieu, I relaxed—a lot. Imagine being at a gathering of thousands of your aunts and cousins, not a single one of whom would be remotely weirded out if you needed to pull them aside for a quick question about, say, some irregular spotting you’ve been having. Many attendees had brought babies. At one standing-room-only symposium talk, a woman with a baby stood near the back of the room. “There’s a seat up here if you’d like,” beckoned the speaker. “Well, I think he might start crying,” demurred the woman. The room erupted in chuckles. “I doubt that anyone here will mind,” said the speaker. Having spent years of my life navigating my young family through crowded environments where a crying baby is categorically not okay, this moment felt to me like a deep-tissue exhalation. And, despite the variety of cultures present, there was one person who bridged it singlehandedly. During the congress, news broke that Beyonce had her twins. Midwives across the world reacted with unbridled joy. Kathryn Jezer-Morton writes about parenting for Jezebel and is based on Montreal. Find her on Twitter at @kjezermorton.